The wide verge on the west side of Grandborough Fields Road is a popular spot for travelling people. This traditional bowtop living van is quite uncommon - usually, the travelers who use this spot live in modern aluminum caravans. 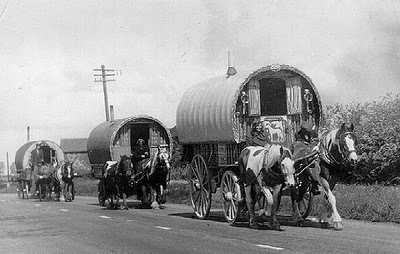 On the day the photo was taken there was no sign of any horses grazing the verge but a flatbed trailer behind the bowtop van suggests it arrived behind a motor vehicle. 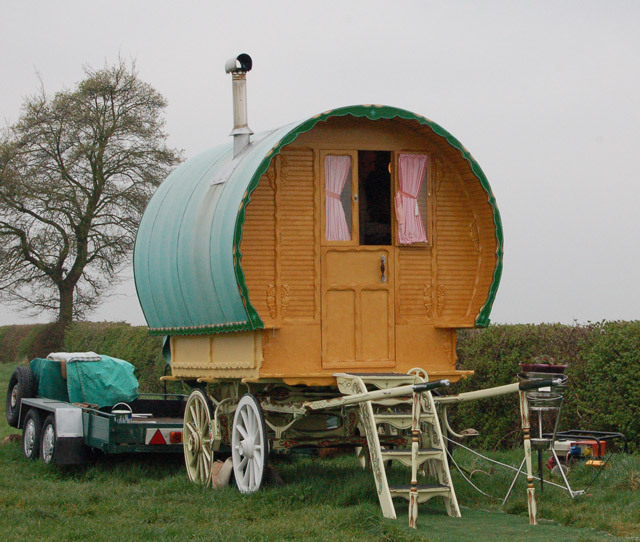 The English term Gypsy (or Gipsy) originates from the Middle English gypcian, short for Egipcien. It was once believed that the Romanies, or some other Gypsy groups originated in Egypt. 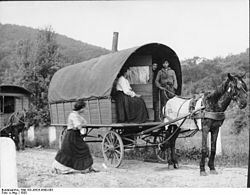 The word gypsy is commonly used as a reference to lifestyle or fashion, and not to the Romani ethnicity.